The Ararat Arts Precinct Redevelopment is on track for completion in the first half of next year. 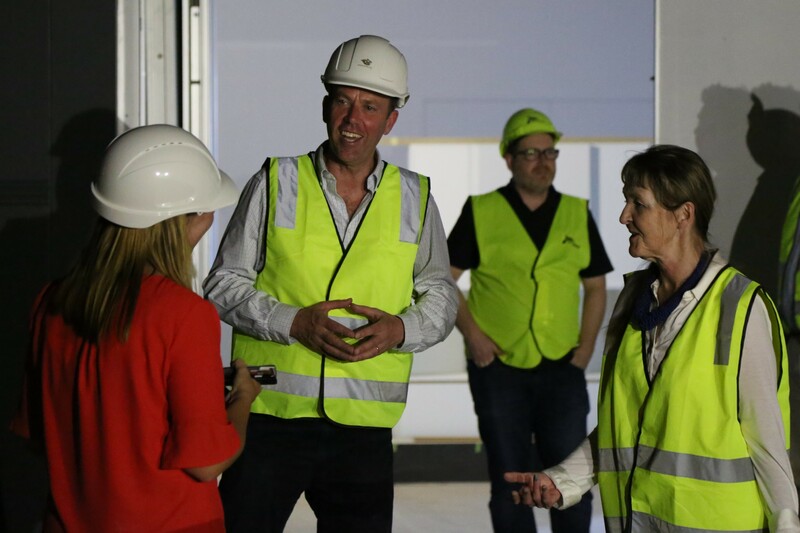 Ararat Rural City Council Mayor, Cr Glenda McLean tours the Ararat Arts Precinct with Federal Member for Wannon, Dan Tehan MP earlier this month. Ararat Rural City Council Mayor, Cr Glenda Mclean said the $7.735 million project was tracking well as it neared the ninth month of 14-month construction program. Describing the redevelopment as ‘arguably the most complex project undertaken by Council to date’, Cr McLean praised the careful project management. “This is a very large-scale redevelopment of a culturally and historically significant site,” Cr McLean said. “It has involved multiple trades and engineering disciplines working in demolition, renovation, refitting and upgrade works, often at the same time. Cr McLean said internal plastering of the old and new gallery spaces was virtually complete, with painting now underway. Twin historic fireplaces in the supper room have been restored, with the space now fully renovated. The box office and bar areas are also taking shape, with brickwork almost complete on the new café and gallery foyer. Cr McLean said that both the performing arts and gallery programs were schedule to recommence in expanded and revamped facilities in the first week of August 2018 when a community celebration would mark the re-opening of the Ararat Town Hall. Meanwhile, a community fundraising effort was still underway to ensure the finishing touches could be applied to the revamped gallery and performing arts spaces. “So far, our community, as well as donors from beyond Ararat Rural City have generously contributed more than $230,000 to help realise this project, which is an extraordinary effort,” Cr McLean said. The Ararat Arts Precinct Redevelopment has been funded via a partnership between the Victorian Government ($5.2 million), the Federal Government’s National Stronger Regions Fund ($945,000), the regional community ($100,000), the regional community and philanthropic organisations ($230,000 to date) and Ararat Rural City Council.